Artists know essential gear when they see it. Never leave home without your Moogerfooger, and your banana. 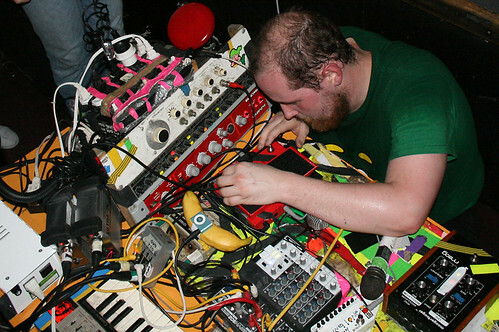 Dan Deacon, surrounded by gear. Photo (CC-BY) Andrew Braithwaite. “Moogfest,” more than just a showcase around a brand, is an event that invokes one of sound’s greatest pioneers, Robert Moog. For a lot of artists, that’s a pretty high bar to meet. The massive Moogfest brewing for October 29-31 in Asheville, North Carolina appears to be attracting sound-loving artists with abandon – with the new organizational muscle of Bonnaroo producers AC Entertainment presumably partly to thank. This week, the festival announced the addition of Hot Chip, Pretty Lights, Girl Talk, Panda Bear, Dan Deacon, Four Tet, RJD2, EL-P, Dam-Funk, School of Seven Bells, Matmos, and Emeralds. It’s looking like a pretty nice way to celebrate Halloween. Moogfest wasn’t always this way. I covered one of the New York events for Keyboard, sadly the night that news broke that Dr. Moog was unable to attend due to health. Some of the artists were great, but some of the experimental spirit you’d expect at a Moogfest was missing, and being stuck in Times Square felt horribly wrong. This massive festival in Asheville could well become one of the events of the year. In fact, I see no reason not to be hopeful about new sonic events around the US and North America. Moogfest can’t possibly cover the gamut of their own user base in a weekend, let alone all that’s happening now in electronic sound. Whatever your neck of the woods in the world, we’re interested to hear from you.